Did you know that you can route component video over SCART? Apparently a lot of people do not. Using an adapter like the one shown on the left here, you can feed component video through your SCART switch. Of course, this doesn’t convert component into RGB, but lots of video processors (DVDO Edge, Optoma Themescene, XRGB3 to name but three that are popular with videogamers) can actually handle both component and RGB scart on the same inputs. On the XRGB3 it’s just a matter of choosing what type of signal is being fed in, while other processors will recognize the signal and switch automatically between the two. This is especially useful for the PS2, for example, where RGB seems to give a better picture but component is the only way to get 480p. Keeping this in mind might help you reduce cable clutter in the future. 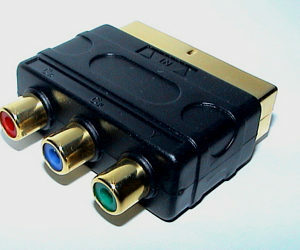 Remember that although you can route component through a SCART switch, the reverse is usually not true, you cannot route SCART through a component switch, even if you find some way to carry the sync signal, there usually isn’t enough bandwidth for the full range of RGB through a component switch, unless it’s designed for component and RGB.